Ruthie here and right now I kinda feel like that dog that floats up in the air and gently floats back down whenever he’s given a treat. What was that cartoon dog’s name again? Do you remember? Today’s mail brought another BIG SMILE to my face. YES!!! ANOTHER HAPPY CLIENT!!! Nothing is better than happy clients. 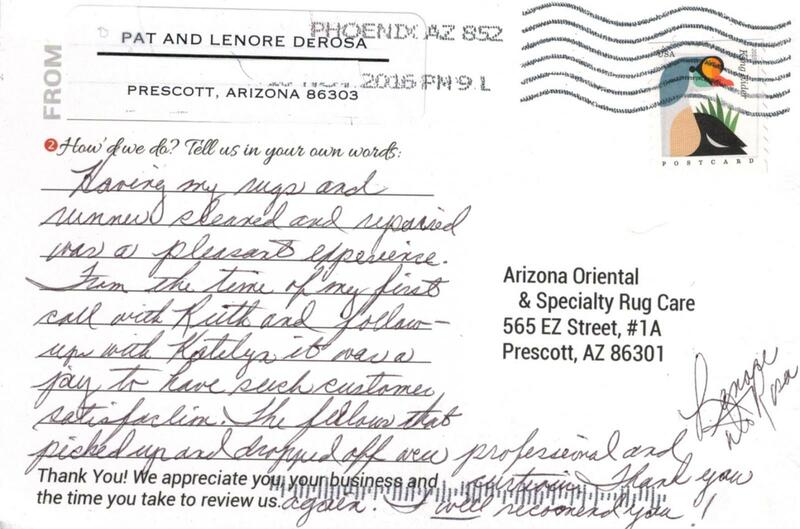 There’s such a pleasure in doing a job well done and here at Arizona Oriental & Specialty Rug Care in Prescott AZ, we strive for this with each and every one of our clients and there area rugs. Whether it is a $50,000 fine, Persian area rug, a Home Depot modestly priced rug, or a priceless handmade rug from Grandma, they are all treasures to my clients! I respect that completely and I take our deep cleaning process very seriously. There are a lot of steps that go into a terrific area rug cleaning – from first inspection to the final post-cleaning inspection, you can trust we will always do our utmost to ensure our clients are pleased. If you have a rug that you have been wanting to get cleaned, it’s a great time to call us now (before your busy day runs away from you).